others find and follow their own artistic path. Kusmin's paintings are the fully fleshed stories of multiple, changing images and impressions, a myriad of memories of a place, the things and people who have graced it. Even in the paintings that do not formally include a human figure, the people are undeniably present – either just now departed or waiting impatiently in the wings. 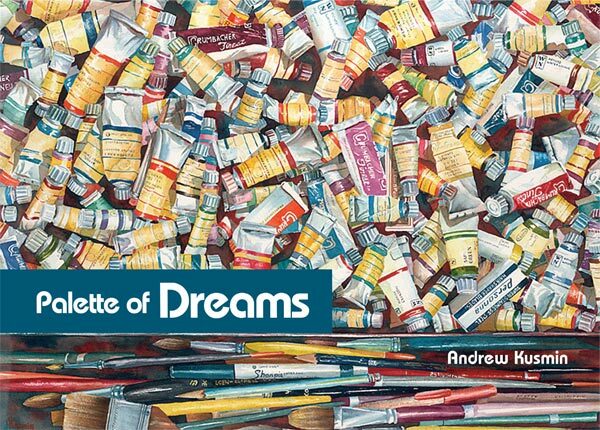 “Palette of Dreams” features more than 200 of Kusmin's original paintings presented in nine “chapters” that reflect the various themes he says best define and catalog his work. Each chapter includes the artist's insight into his journey to and through the theme, and many of the images also feature an inside look at the story behind the painting. Whether the work depicts a chaotic street scene or a calming coastal vignette, an intimate look at a single blossom or a panoramic study of a family farm, a single vacant chair or a myriad of repeated images, Kusmin demonstrates his gift for capturing complicated and often intense stories in a single moment, always with a promise to unveil even more layers of the tale with each new look at the painting. To order your copy of Palette of Dreams, choose from the following purchase options. The cost of the book is $48, which includes the tax, plus $6.75 for shipping to anywhere in the continental USA. For addresses outside the continental U.S., please call the gallery at 508-746-9215 or email Andrew at andrew@kusminarts.com. Palette of Dreams is also now available in the shop at the Plymouth Center for the Arts, located at 11 North Street in downtown Plymouth, Massachusetts.